As our industry continues to face the challenges of globalization and increasing scale and utilization of vessels, we must continuously look for ways to improve efficiencies. Shipping companies and port operators must look for smarter ways to deliver against these expectations. SmartPort by Trelleborg powers the critical interface between ship and port, on land and at sea. Building on Trelleborg's history of engineering ingenuity and sector knowledge, with a keen eye on data capture and management, and technology-driven insight, SmartPort technologies can increase efficiencies, improve safety and improve ROI for ports and vessels alike. 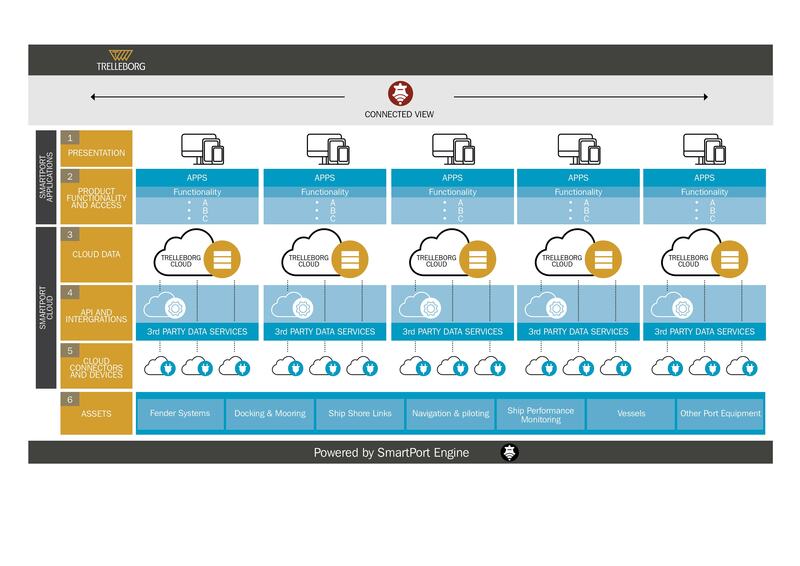 SmartPort connects port operations, allowing operators to analyze performance and use data to improve decision making. The system integrates assets like fenders, mooring equipment, ship performance monitoring, and navigation systems through a network of sensors. SafePilot represents a new generation of piloting and navigation software which provides the highest reliability and safety levels. AutoMoor is Trelleborg's rope-free, automated mooring system designed to make berthing operations smarter, safer and more efficient. With DynaMoor, Trelleborg combines its industry-leading Quick Release Hook with an innovative constant tension system to better manage mooring line safe working loads and reduce vessel motions whilst at berth. Trelleborg's Quick Release Hooks (QRHs) enable mooring lines to be safely secured, and quickly and easily release even under full load. Trelleborg's SmartHook® load monitoring system provides real-time readings of the load on mooring lines. Trelleborg provides Laser and GPS based solutions to assist in vessel approach and berthing operations. Trelleborg integrates docking, mooring and environmental systems into a logical and easy to operate MM (Marine Monitoring System) to optimize safety and optimize productivity. Trelleborg's Environmental Monitoring System give operators data to maximize their berth's operating windows. Trelleborg is the market leader with almost 700 systems installed worldwide, including LNGCs, FSRUs, FSU, FLNG, LNG terminals and small scale LNG fuelling operations. Supported 24/7 by our global service team. Designed for use with the LPG, Oil and chemical tankers, our ESL is compliant with OCIMF guidelines and ISO20519 for LNG fuelling operations. Our ISO20519 and ISO28460 compliant USL provides critical pressure, temperature and tank level data to enable rapid and reliable decision making. Trelleborg's Ship-Shore Link (SSL) and Emergency ShutDown System (ESDS) are engineered for both large and small-scale LNG operations. Fundamental to this is the SmartPort tech stack. The tech stack describes the architecture and operation of the SmartPort platform. Performance data is captured through sensors and transmitters located on assets in the port and vessel environment. This data is standardized and stored, to enable seamless interrogation when it is accessed. Trelleborg's sector knowledge and engineering expertise inform the analysis of this data to present the most relevant and robust insights and recommendations. Finally, consistent data is presented in an easy to access format to relevant stakeholders, across a range of device types.